Rupal uniquely draws on her personal struggles to professionally empower women. 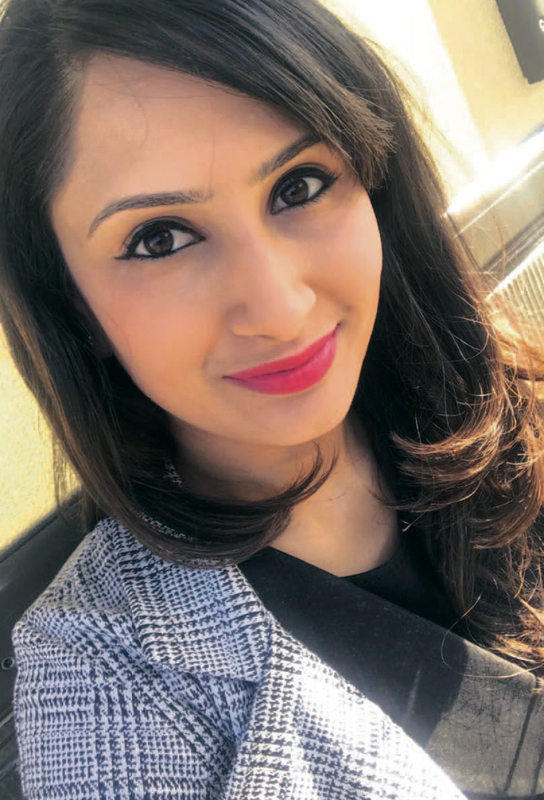 Using her successful background in the real estate field, the young spokesperson represents her particular vocation for the Lean In organisation: a global community dedicated to helping women achieve their ambitions. 28-year-old Rupal works in the property sector. She has been affiliated with organisations such as Workman LLP, BNP Paribas Real Estate, Nottingham City Council, Carillion Plc and CBRE, but makes it clear that what allows her to be particularly adept is the emotional fortitude she has developed upon enduring as a twenty-year-old minority woman. Rupal now boldly speaks on women’s empowerment with a special scrutiny on the gender inequality in her field: one that is typically “male-dominated.” She encourages women and men alike “to check their unconscious biases.” Having conquered a lot so young, she is in a prime position to motivate other up and coming women to claim their stake. In addition to her real estate career, Rupal has also branched out into the food industry, starting a vegetarian cake franchise, Cakebox: “I do have a very creative side and am going to continue in this area. I hope to move into healthier food options and grow my entrepreneurial interests that way.” Rupal’ s deep, philanthropic resolve has been evident since her early adult years: “worldly matters are important to me. I’ve always strived for opportunities of social and charity work alongside academia. Before starting my career in property, I had entered the global village challenge project by the international charity, Habitat for Humanity, where housing is erected to help the impoverished on a global scale. I fundraised and actually physically went out to Hungary to help build homes with the families concerned.” Rupal added that: “a spiritual dimension has always been central to maintaining balance. It certainly helped me deal with adversity and I am continuing to grow. I have really benefitted from the values of compassion and strength that come of it.” The female fighter states she inherited these qualities from her birth family, which helped her later: “reflecting on younger life, I remember how fortunate my siblings and I were to have had the communal power of the Gita and social work shown to us by our parents. My father would lead us in philosophical study and my mother would involve us social work. After dinner we would engage in spiritual readings and devotional poetry. That stayed with me and shaped the person I’ve become.” Coming beautifully full circle then, Rupal demonstrates how a meaningful collapse of the work/life divide creates a truly sound model for achievement. Systematically turning obstacles into strengths, she has made the personal a powerful tool in the professional arena, not only helping others, but infinitely realizing herself. Speaking of the work/life balance, tell us more on what might be done to help women in this area? It does come down to the bias or subconscious bias that people have and the generational views that have been developed over time. For example, the reluctance of maternity leave being a shared experience with one’s partner. It is important that this social parity is awarded. When women are interviewed at a certain age, they are often devalued based on whether or not the interviewer believes they are going to have children. Development of career and personal advancement is obstructed but women bring a lot of value to their work places. This is why I enjoy encouraging male engagement in such dialogues. It’s important to understand why men view the situation a certain way and speak to these unacknowledged prejudices. What sort of powerful symbol are you hoping to be for women? I want to be a symbol of strength, courage, resilience, compassion and humility. My late mother has always inspired me and she taught me self-belief and the confidence to pursue in the direction of my dreams and righteousness. What has been a highlight achievement in terms of that ethos? Overcoming personal issues to be able to do well entrepreneurially and socially. I’ve also enjoyed working with young girls and young women, advancing them and creatively encouraging them. Tell us more on your personal story? For a young woman in Indian society who has been brought up to appreciate and value these principles, I often found myself in situations during the challenges I faced in life, battling in my own mind to try and work out how to maintain some of these societal pressures created by Indian society. I have been fortunate enough to have a loving and supportive family who have supported me through these changes whilst maintaining the values of our cultural teachings that has empowered me to break away from these pitfalls now. At one particularly difficult time in my life, one powerful piece of advice I received was: "Everyone out there is fighting their own battle. This is your battle and if you continue with the strength and fight it courageously, the world will fight with you". Finally, do you have a favourite quote? “Awake, arise and don’t stop until the goal is reached'' by Swami Vikekanand. Spirituality is again starting to play a pivotal role in strengthening my place and reminding me how to use difficulties as opportunities and using our strengths that the Supreme Being has gifted to us at their best potential. This means to do all wholeheartedly and to do our best in swadharma. I continue to develop my knowledge of the Gita and have particularly found Shyam to be a useful resource and soon to be seen as a speaker at their events also.